This story is unlike any you have ever heard; a true little medical miracle. Kitten Duecy, known as the two-faced kitten was born Tuesday June at 6:11 am. She is a Janus cat, born with Diprosopus, which is a genetic condition in which an animal has two faces. Janus cats are named after the Roman God, Janus, who also has two faces. They are quite rare little creatures with only a few reported births taking place all over the world. Owner, Stephanie Durkee discovered the little kitten in her cat’s litter when her kids came running to her about a kitten with two heads. She didn’t believe them at first, but when she saw for herself, she had to look twice. What she saw was a kitten with four eyes, two mouths, and two noses. Duecy is quite the adorable little thing, and has a sweet personality. In fact, she is even known to meow loudly using both her mouths. She has fortunately been blessed with much love and attention from her attention, but be warned, the story takes a sad turn. Little Deucy was orphaned by her mother. Unfortunately, that’s not all. 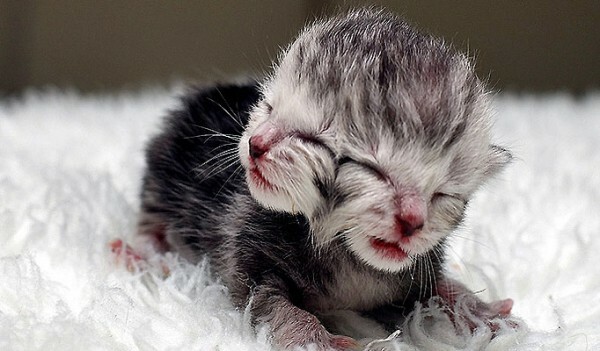 Janus cats, like Deucy, are known to die quickly after they are born from internal complications. In fact, another two-faced kitten, born in 2012, Harvey Dent, is quite comparable to this story. He died only a few short days after his birth. Despite all this bad news, there isn’t reason to lose hope just yet. The Guinness Book of World Records has reported Frankenlouie, a Janus cat, has lived up to 12 years. That’s good news for Deucy! On the plus side, the vet reports that although Duecy be a two-faced kitten, she is a healthy one at that. While nobody knows what will happen to Deucy in the future, while she is alive and well please send her your well wishes, good thoughts, and lots of love. Stephanie is hoping for the best, as are all us animal lovers. As her surrogate mother, Stephanie feeds the kitten formula daily, and even states that Duecy appears to be stronger than all the other kittens in the litter. Who knows, she may be the one to go against all odds, and live a happy, normal life!